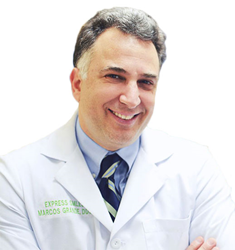 Dr. Marcos Grande releases new website promoting the understanding of sleep apnea – its symptoms, dangers, how it is diagnosed and treated. Most people with OSA are not aware of it and that is the most scary part of this condition. Grande Dental Care, a premier provider of dental services in Herndon, VA, has now placed resources online to help individuals become aware of the serious nature of a relatively unknown physical condition known as sleep apnea or OSA (obstructive sleep apnea). The website address is http://www.grandedentalsleepsolution.com. OSA is a condition which occurs during sleep when an individual actually stops breathing for many short periods of time during the night. This happens because the tongue falls back and closes off the throat airway for a short period of time until the body reacts and gasps for air. It is associated with snoring, but not all individuals who snore have the condition. OSA is associated with a number of serious physical conditions ranging from excess tiredness to high blood pressure to being responsible for traffic accidents. “Most people with OSA are not aware of it and that is the most scary part of this condition,” comments Dr. Marcos Grande, founder of Grande Dental Care. “Because the condition has to do with the position of the jaw and tongue during sleep, dentists help in the treatment of the condition by providing treatment through oral appliance therapy (OAT) which is a first line of treatment for mild to moderate cases, and for CPAP intolerant patients, based on the American Academy of Sleep Medicine 2005 treatment protocol." Dr. Grande helps individuals become mindful of OSA by providing initial diagnostic testing up to and including a sleep study that is done at home. “There are a number of tests we perform, starting with an online questionnaire, to help determine the condition. We have state-of-the-art diagnostic equipment in our offices that measure the capacity of nasal and throat passages to see if the person might be susceptible to the airway shutoff. If they are, we send them home for a sleep study with a high tech electronic headset that they wear overnight and measures bodily responses,” explains Dr. Grande. The sleep study is reviewed by a sleep physician to determine if the person has OSA and if so, whether is mild, moderate or severe. If severe, Dr. Grande then assists the person with treatment options including CPAP (Continuous Positive Air Pressure) therapy. CPAP consists of a machine with a face mask that generally covers the nose and a pump which pushes a constant air pressure through the nose and into the throat. The pressure works to push back the tongue, soft palate or other tissues that are obstructing the airway. If the condition is mild or moderate or if the person is CPAP intolerant, Dr. Grande can provide a custom intra-oral mouthpiece that will hold the teeth and jaw in a position to prevent the tongue from falling back during sleep and thus preventing the apnea. Such a device is also useful for treating problem snoring. But snoring is not life-threatening, although it may have adverse consequences for a relationship. “Sleep apnea has so many negative emotional and physical consequences, that those who might have the condition need to find out if they do and get it treated for their future health and happiness. There is a saying – if you snore you may not have sleep apnea, but all people with sleep apnea snore,” concludes Dr. Grande. Dr. Grande has been in the dental field for over 20 years. He takes over 150 continuing education hours per year, well above the 15 hour required from the profession, and has been recognized as one of America's Best Dentists for 2014. He has been specially trained in the field of sleep disorders dentistry and he is a member of the American Academy of Dental Sleep Medicine. Dr. Grande's dentist office in Herndon is a fully equipped dental facility offering complete and expert dental services in one office, including dental implants and treatment for sleep breathing disorders such as snoring and sleep apnea. For more information, contact Dr. Grande at (703) 471-7164.